70% of Fans Are Being Ignored By Companies – Now what? Now it´s time to set a new standard in social media marketing – we are announcing the most Socially Devoted companies that will set a new benchmark for customer care in social media. 1. Open yourselves – make sure your Profile (Page Wall) is open to questions and feedback from your fans. Over 25% of global brands close their walls! Social networks encourage brands to develop a more personal relationship with their fans. But do brands on Facebook take advantage of this great opportunity? Our statistics reveal that 7 out of 10 questions from fans don’t get replied! Brands respond only to 30% of questions posted by fans! Companies want to make money but only a minority of brands knows how to harvest the power of social media ROI. An incredible 70% of questions from Facebook fans are ignored which completely contradicts the interactive nature and purpose of social networks. What´s even more alarming is that 25% of global companies go as far as closing their wall on Facebook to prevent fans from asking questions at all. To discover the most Socially Devoted companies, visit our special website www.socially-devoted.com where you can gain insight into the TOP 5 most devoted brands in each industry with their Response Rates, Response Times, numbers of fans and replied questions. The website also describes the metrics we have applied and includes related articles to the topic. If you want to check out the metrics for your own company and are not in the list, use Socialbakers Analytics PRO to find out. Our study provides interesting insights into industries that demonstrate high levels of social devotion. 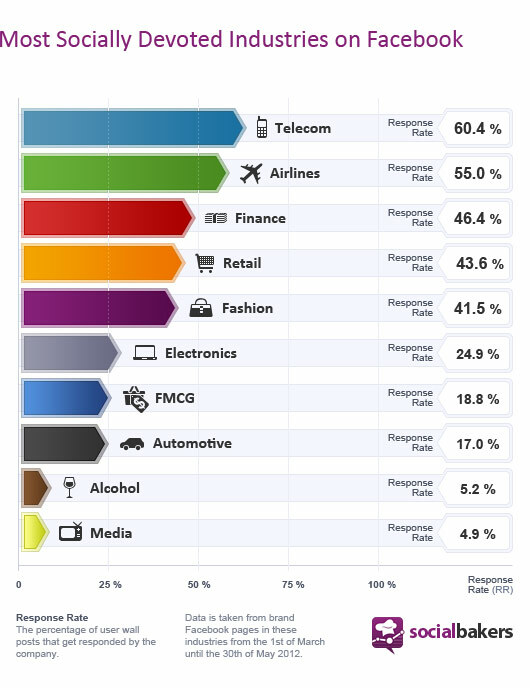 The telecommunications and mobile industry are by far the most Socially Devoted while alcohol and media brands lie at the bottom of the chart. Why Is It Important To Become Socially Devoted? Do you feel devoted to your fans? Remember, that that´s what will create a relationship built on trust which is ultimately the strongest relationship you can imagine. And it will progressively translate into higher engagement and more fans converting into buying customers. Your brand needs to be where your customers are, which is why you need to focus more on customer care in social media. We believe that in order to become Socially Devoted, you also need to measure your brand´s and your competition´s performance. We have been monitoring tens of thousands of companies in social media, and found it as an obligation to release this data. By setting industry benchmarks, we want to inspire brands to shift their strategy towards more socially oriented marketing. Our vast amount of data and analytics expertise will help define Socially Devoted companies and the standard for profitable social marketing. So go ahead, log on to www.socially-devoted.com and check it out! We don't want to suggest that you should share / tweet this article, but it would be nice if you could. Our Q2 Socially Devoted numbers are in, and - surprise surprise - they show that Fans want to engage with brands. Customers increasingly prefer to voice their opinions and get answers to their questions on social platforms.